For six weeks, the editors of New York Magazine and Grub Street are publishing a series of definitive lists that declare the absolute best versions of 101 things to eat, drink, and do. Here are the best hookup bars — spots where you might head for some fun, flirtatious entanglement, or at least a bar-stool make-out session. Specifically, duckduck on Friday and Saturday nights, when the 20-something hordes pile into this ten-year-old dive-ish bar so closely that even on winter nights you’ll want to take a break for gulps of fresh air out on the sidewalk. While on other nights the scene is a relatively laid-back neighborhood bar, weekends find rowdy dance-offs here to ’90s hits (Ginuwine’s “Pony,” anyone?). 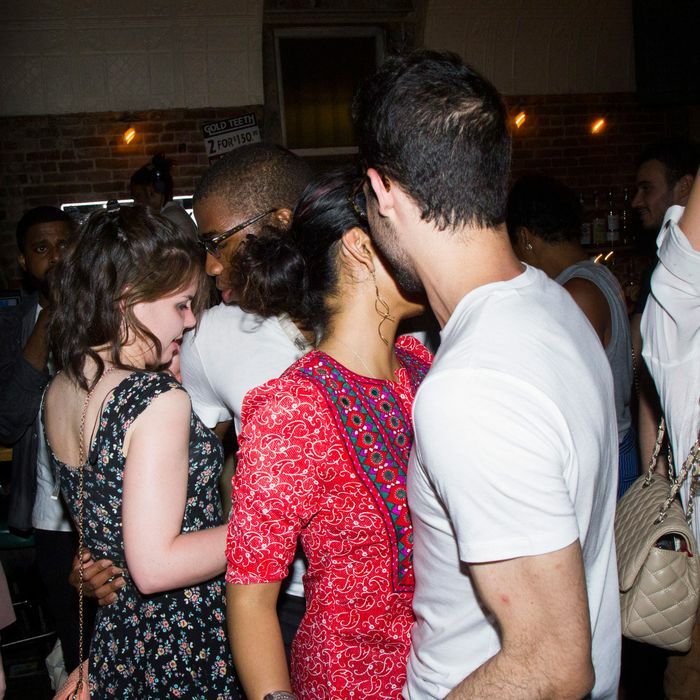 Pick up a dancing (well, grinding) partner, and bring him or her with you on one such break, because there’s no hope of a make-out sesh within the bar. Note that duckduck’s a couple of blocks from several much-more-subdued bars (the Graham, Featherweight), where you might head after you’re finished dancing to drink a cooldown cocktail and, say, learn your new friend’s name. This little living-room-like bar (with a Christmas-light-bedecked rooftop) has a pretty, Victorian feel about it, decent drink prices ($6 cocktails at happy hour), and a casual atmosphere. Also, everyone’s hand is on their neighbor’s thigh. There’s plenty of couches and perfect spots for two, and unlike its neighboring sin-den (you know the one: Union Pool), you can meet someone here and not have to disclose where you met with a knowing giggle. This cocktail bar has private couches with curtains and a buzzer to call your waitress — a little on the nose, maybe, but it works. It’s a good deal more “highbrow” than the first two on this list, and your check will reflect that, but at least you’ll have your dignity. Raines makes very good drinks and is a very pretty bar and is, for what it’s worth, very near to hotels like the Dream. This place is particularly winning on a night when it’s warm enough to sit outside for a bit in Ice House’s relaxed and large backyard. Grab a $5 beer-and-shot special at the bar, place an order for food, and head out back. Choose someone from the groups of friends (lots of locals and servers from nearby restaurants), ask them to light your Parliament, and the rest will probably be history. The types of people who find you attractive even as you eat in-the-bag Frito chili pie are probably good people, right? You might at first guess this bar is a little past its time; it opened in 2010, when food blogs deemed it a “speakeasy.” But you really shouldn’t discount it — especially for its 2 a.m.-to-4 a.m. $7-cocktail happy hour. Drop by around then and snuggle up at one of the booths, or in the little back nook, or out on the teensy below-ground patio. There are candles; it’s low-lit; and the booths are black tufted leather. If you can get past the name, the place is a very good make-out venue. Head to the Woods late at night and you’re pretty much guaranteed to find a crowd of 23-year-olds looking to not take the L train back to their own shared Bushwick apartments (and instead to take a Lyft to another 23-year-old’s shared apartment, but maybe in Ridgewood, or Crown Heights). No one is saying the Woods is super-classy, but it is fun.